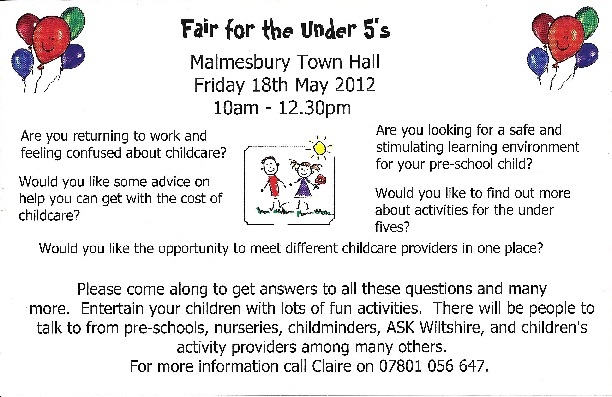 Acorns Pre-school are organising the Fair for the Under Fives in Malmesbury Town Hall on 18 May 2012 between 10am and 12.30pm. Everyone welcome, its free entry. Talk to nurseries, pre-schools and childminders and find out about the benefits and drawbacks of each type of childcare provider to help you decide what is best for your child and you. There will also be lots of fun activities for your children to do and tea, coffee and cake. Contact us on 07816 280 810 for more details. What more could you want on a (wet?) Friday morning?